SFTraxx.com - Buying Beats Online: What Format? Buying Beats Online: What Format? Spending 2 minutes reading this will help you save time (and money) when you buy beats online so don't play yourself ~ pull up a chair and lets begin. Session files (or track outs) which typically come in WAV. Let's break these down starting with the .WAV file type. The .WAV file type is the little brother of the PCM sound format. PCM (Pulse Code Modulation) was developed back in the day to carry analog phone calls over digital phone lines. The .WAV file type is a must if you need a clear, uncompressed, version of the beat. Make sure you get the beat exported in at least 44.100 KHz | 24bit Stereo. *16 and 32 bit formats are also available but 24 bit is ideal in most instances. The downside to WAV files is that they are huge in terms of file size. WAIT! Don't go and buy beats just yet..
First lets talk about MP3. Since the .WAV file type is so large, programmers developed a complex "algorithm" (a formula to solve a problem) to shrink it. This [algorithm] code is referred to as a "codec" and the most common type is the "MPEG-1 Layer 3" codec - commonly known as the "MP3". This .MP3 file type "compression" (shrinking) allows you to shrink a WAV file by up to 12 times before losing a noticeable amount of sound quality. Although the .MP3 can be used in the final mix it is ideal to get the WAV files for maximum clarity. Ideally when working with MP3's you want the MP3 in 16 bit | 44.100 KHz as well. And a minimum 192 KHz sample rate. WTF is a sample / bit rate / sample rate? Basically, a "sample" is how computers capture audio. A "Bit rate" is the amount of information (# of bits) transferred from the compressed file to the mp3 in 1 second. eg: The higher the bit rate - The higher the sound quality. A "sample rate" is how many times per second the sound is sampled. 16 bit | 44.100 KHz stereo is standard CD quality. 192 KHz sample rate is ideal when working with MP3's and is basically better than the human ear can perceive. Read that again if you need to. lol. What about session files / Track outs / stems? Well, taking the info above you can now see why you want the session files. The session files are basically the beat sounds (eg: piano, synth, drums, percussion, etc) separated (in high quality .WAV format) track for track and exported into a file folder. That way they can be imported into the studio computer (track for track) for optimum arrangement, mixing and volume adjustment. So what format type should I buy for my project? Ideally if you care about the sound quality of your project you want to get beats in .WAV format (for most applications). It doesn't matter is its for Background Music, Rapping, A Podcast, Spoken Word or Singing. WAV format is the best and most widely used. From my experience, a lot of Artists initially download beats in .MP3 format and then typically return to buy the .WAV version when they are mixing their project. Need a WAV file Converted to MP3? Try this online file converter I found. Simply upload the WAV file, select the output format and quality and you'll have an MP3 in no time. 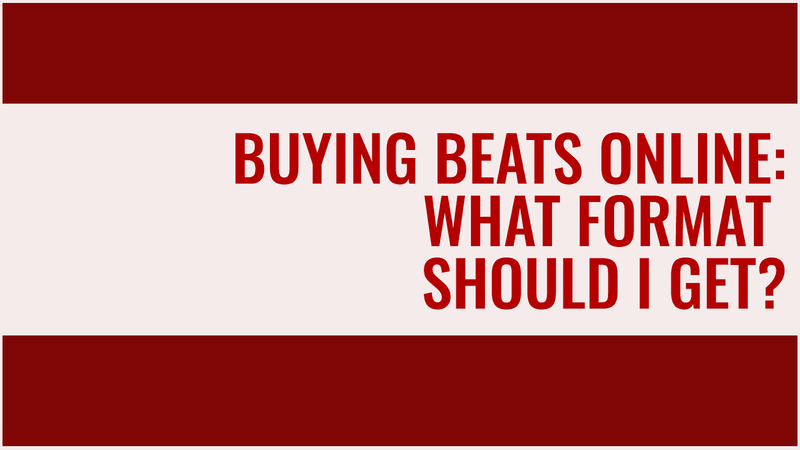 Now although this post covers the 2 most common format types when you buy beats online there are others to be aware of such as MIDI, AAC, AIFF, FLAC, OGG etc but rest assured .WAV and .MP3 are most common and the most widely used in most recording studios. If you want to learn more I mos def recommend taking Audio Production at your local community college. I tried my best to keep this post short. *If this post has helped you out please help support the site by sharing it on your preferred social networks.